In January of last year, mother and daughter team Sonali Gunasekera and Jessica Blanco opened the White Elephant on Barkly, in a pocket of West Footscray known for its Indian restaurants. Daughter (Blanco) runs the front-of-house in a stylish shopfront dining room, while mum (Gunasekera) is chef, cooking intensely aromatic and satisfying Sri Lankan food. 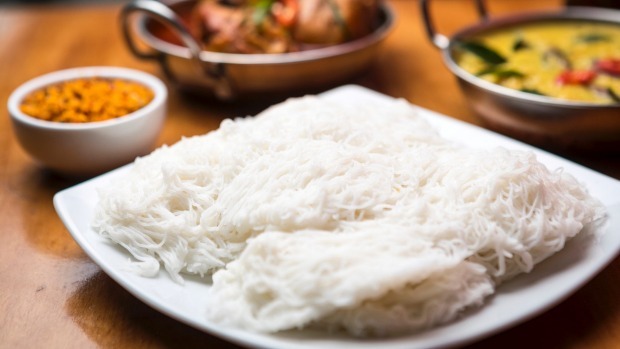 In just one short year, the White Elephant has gathered a following for a few standout dishes on an extensive menu of roti, rice plates and curries. 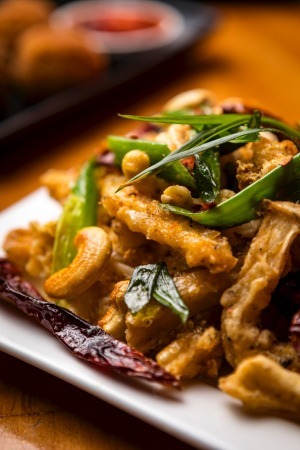 It would be hard to choose a favourite between the cashew curry and the eggplant moju, but thankfully you don't have to. The combo meal dinner ($22) includes rice and your choice of two vegetable dishes and one meat dish. 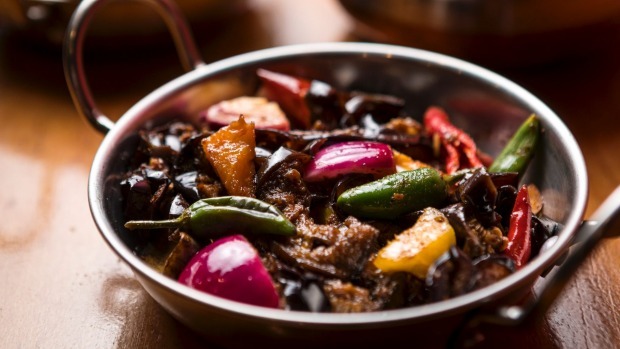 The moju consists of thinly sliced eggplant that is twice-cooked and almost caramelised, tossed with spices and a hint of cinnamon. 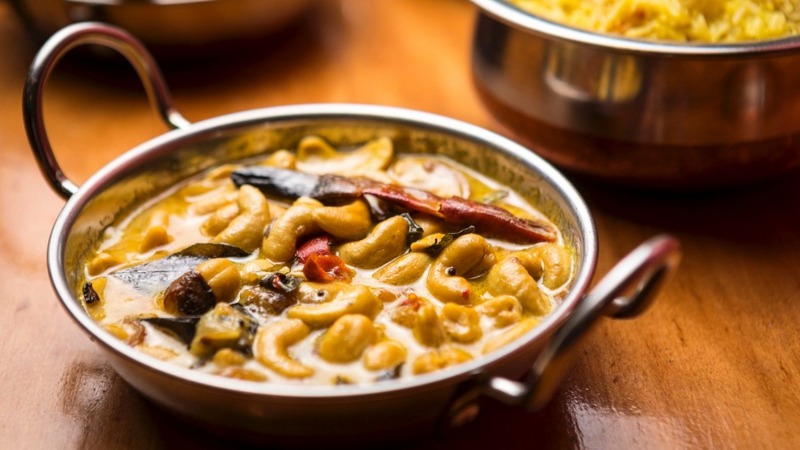 Cashew curry, if you've never had it before, might come as a bit of a revelation. The cashews are cooked in coconut milk for long enough that their consistency becomes more like a firm, creamy bean, but with all the velvet nutty sweetness inherent in cashews. Cashews show up again dotted throughout the fragrant yellow rice ($10), which is cooked with coconut milk and saffron and can easily act as the unassuming star of a meal here. A staple of Sri Lankan street food, the kottu roti ($18) is shredded, tossed with leeks, egg, meat and spices, and then stir-fried. It is addictive and comforting, the type of thing you'd want after a long night of drinking and then again the next morning with a fried egg on top. Speaking of drinking, there's a huge array of Sri Lankan arracks (distilled coconut spirits) to be sampled here, along with a standard selection of wines and beers. The restaurant has all the charm of a complex operation run by a two-person crew, but also some of the pitfalls. The meat in the goat curry was hit or miss – some pieces tender and juicy, others chewy or mostly bone. The okra, stir-fried with chillies and shallot, was bracingly vegetal – but around every fifth piece was too woody to eat. Some dishes take a very long time to make. I've been tempted by the lampraise, a rice and meat dish that's baked in a banana leaf – but was ultimately turned off by the estimated 55-minute cooking time. And I've driven across town during advertised business hours only to find the place inexplicably closed. But most of the flavours at White Elephant are wonderfully vibrant – comforting and homey but also cooked with the care of a talented chef. It's worth a drive from anywhere in Melbourne – but you might want to call ahead, just to be sure. Must-order dishes Cashew curry ($20), eggplant moju ($15), kottu roti ($18).